Jesus told them plainly that once they reached Jerusalem, he would be turned over to the Gentiles, be beaten, and then killed. Yet on the third day, God would raise him from the grave. Even as we know this to be true, the disciples had difficulty accepting Jesus’ words. The prophets foretold it; Jesus affirmed it. All Jesus said would certainly be accomplished. Sometimes, when we must face the truth, we have difficulty accepting it. An adverse diagnosis, news of a tragedy, or simply owning up to our own failures can cause us to express disbelief. Even as we know these things are true, we sometimes turn a blind eye hoping everything will pass. As Jesus drew near to Jericho, a blind man called out to him. Those lining the streets tried to stifle his voice, yet he called out all the more. Though blind, he had vision; he knew Jesus was the Christ, the one promised from God, the one who would redeem Israel, the one who had the power to restore his sight. 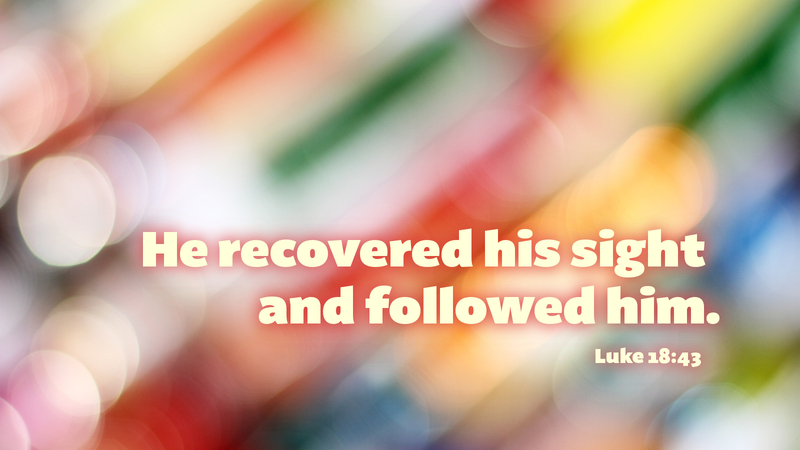 Facing the truth, he called upon the Son of David, and his sight was restored. Certainly, we should do no less. Prayer: O Christ, restore our sight, so that in you we may see our salvation. Amen.